It is not easy to understand what rules apply to drone taxpayers in Guatemala. In this article, I collect all relevant information. UAV Micro: Drones with a mass of 100 grams or less. UAV Pequeño: drones weighing more than 100 grams and less than 150 kilograms. UAV Grande: These include, among other things drones weighing more than 150 kilograms. What influence the categorization has on the regulations, I have not understood so far. As far as I understand the terms, you must register each drone with the DGAC, and you will then receive an identification number, which you must attach to your Copter. Maximum Altitude: In Guatemala, do not fly your drone higher than 120 meters (400 feet). Maximum horizontal distance and FPV: No information available yet. Compulsory insurance: The legislature in Guatemala expects you to insure your drone. Maximum take-off weight (MTOW): No information available yet. Distance to airports: To airports, your drone should keep 5 kilometers (3 miles) distance. Other safety distances: No information available yet. Hours of Operation: Night flights are not allowed in Guatemala with drones unless the drone is visible through adequate lighting. Requirements for Commercial Pilots: Commercial pilots need a Certificado Operativo (CO) to use drones in Guatemala. 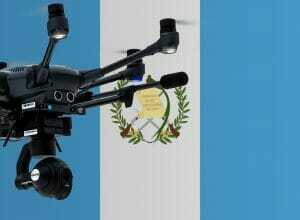 We have researched the listed drone regulations for Guatemala to the best of our knowledge. We cannot guarantee the correctness of the information. If you want to be on the safe side, contact the competent aviation authority. Alternatively, you can also ask the embassy in your country for further information about the regulations. Please leave us a comment when you receive news and/or gain experience with your copter in Guatemala! Has anyone had any troubles entering the country with a drone weighting 900 grams (mavic pro/pro 2)? Does one need to buy a permit of some sort in order to fly your drone in Guatemala? I entered Guatemala by land from Mex and no one checked my luggage, in fact, my passport was stamped in 2 minutes and I was sent on my way. However, entering the country by air might be different. At which border crossing did you pass? I entered through El Ceibo border crossing. Did you have your own car? ok, thanx….i drove my car through the La Mesilla border crossing and it was a small place and pretty easy crossing….i was wondering if El Ceibo would also be an easy crossing….